I love this rug it look so nice in my living room and has held up VERY nicely with my 4 year old beagle. Made from 100-percent premium polypropylene, this gorgeous area rug features a low pile and luxuriously soft feel. The rug provides instant energy in any space, for a refreshingly dynamic piece that's sure to impress and delight everyone who sees it. Dimensions 36.0 In. X 7.0 In. X 7.0 In. 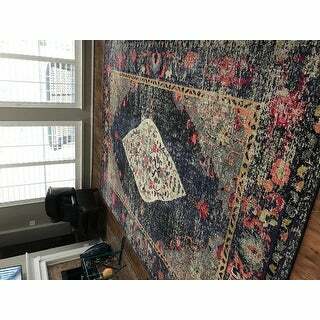 I purchased this as a replacement for another Overstock rug that I bought, a neutral. I love the look of neutrals with a pop but found that its not practical to use a neutral rug with a young child. So Instead wanted a rich pop of color for my urban/ MCM living room, something not too bright or traditional, modern and feminine. I looked at hundreds of rugs and decided on this one. In reality its pretty true to the photo with the exception of being quite a bit darker. It looks mostly denim blue, beige and pink in the photos. In personal it is midnight navy blue, deep fushia-red, burnt orange and the areas in between the medallion and border are more dark gray than brown or tan. Thats ok with me! I like that its not too traditional which I find dated looking, is dark enough not to show dirt quickly (an issue with past rugs) and has enough of a pop of color on my standard beige apartment carpet. It blends well with my Mexican print (aztec red/blue/black print) chair AND "Cozy" rose shag rug (purchased here). After I clicked purchase I worried that it would be too pixelated and too thin, cheap. That it isn't. Its just a TAD more plush than expected but also slightly more rough to the touch than expected. It does not have a silky soft feel. Its pile roughly 5-7mm high- very low but not flat or thin. Doesn't need a floor pad to soften it, perhaps to stabilize it if you have wood floors. It doesn't seem to bunch. Its a decent mid quality rug. Now my only worry is that the blue border and backing may not be colorfast as is my experience with nuLOOM brand rugs. The last nuLOOM rug I bought bled into my pale carpet. Well see. I like it. This isn't a style I typically go for when decorating my home so I was a little nervous buying this rug (I was trying to add more color to my all white everything living room). But I was overly impressed by not only how gorgeous this rug is, but by the quality as well! It's so soft, so beautiful and was such a great buy! Love this rug! If you are looking for distressed rug with hints of pink I recommend this one. 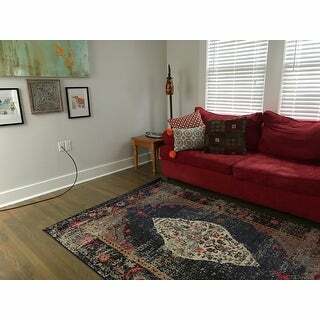 The color of this rug is slightly more muted than it appears in the picture, especially the picture looking straight down on the entire rug. The color is closer to a teal than a turquoise. I was looking for a color that pops, so I will be returning this rug. Overall the quality is good and the mix of colors is still nice, just not the shade of blue I wanted. This rug is unique in every way. It’s has a great vintage feel, with lots of color. I love how the navy grounds it though. It really brings excitement to my art studio. I wanted a rug that was interesting, colorful, yet rich and distressed. This rug is al of these things. The red is a bit more fushia but I’m ok with that. It was a great buy for the size. I’m very pleased with it. I have a friend that ordered it in the next size up because she loved it so much! It doesn’t have a real high pile, but it’s great for what I needed. Beautiful rug! I couldn’t be happier. I’ll cery impressed with this company. 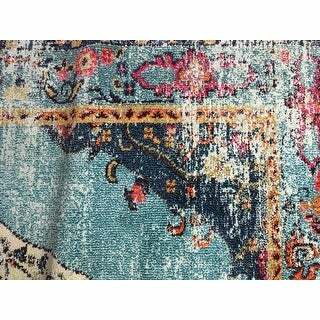 I love my nuLOOM Traditional Distressed Medallion Area Rug! It’s perfect for my living room. I tell my friends and family to shop at overstock you get really good deals and the quality of the product is great! Love this rug. The colors are really great & feels like a great quality piece for the price. This is the second rug from nuLOOM I've purchased & would recommend. I love this rug! 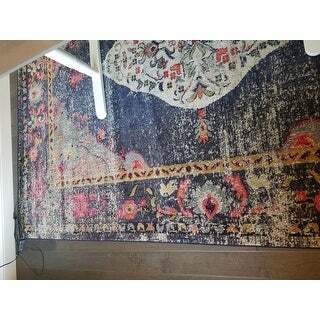 I purchased 2 runners of the nuLoom traditional distressed medallion rug in dk blue, for our hall and kitchen. They are so soft and very easy to clean especially given there is low shag. Our dog slips on the tile in the kitchen and this rug helps her feel safe. Its weighted enough that it doesn't slip around- but we don't have anyone running around the house either. The pattern is clear and not so distressed that its hard to make out like some of the other styles. I am looking for another NuLoom to add and definitely do recommend! Gorgeous rug, even prettier in person. I bought a rug pad to go under the rug which I highly recommend. Great rug for the price! Love the look and feel of this rug. Soft feel and bold colors pop out. Using in a master bedroom and the rug is a focal piece in the room. 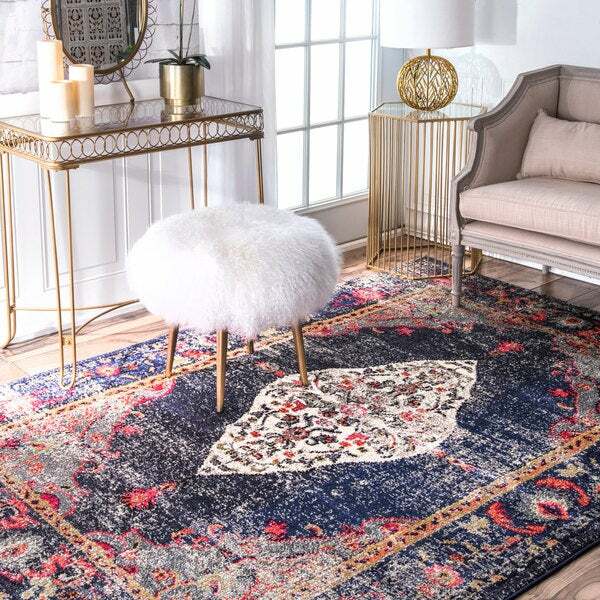 Online this rug looks navy with pink accents. In real life it's orange and red with a lot of tan colors. Love the pattern but colors are way off. Love it. Perfect for our living room. Originally bought this for our Master Bedroom, but I found another rug I liked better so this ended up in our living room. We have a large sectional so it was the perfect size. It is great in such a high traffic area. Doesn’t show every tiny mark or scuff. Easy to vacuum, it’s soft and doesn’t shed. The turquoise in this rug is super bright. It also looks aged which is what I wanted. It is used in a guest bedroom and pulls in all the bright colors. It is thinner than expected so I used a heavy duty pad to compensate for that and it works well. beautiful, soft, easy to clean. happy!!! Arrived on time. Looks great. Fun, bright colors, love the pattern and size is perfect under our table. Great for pets as you don't see the hair. Wish the quality was a little better. But it's a great price! Blue and pink. Great for a kids room I think. Adult looking pattern but great with tile. Pink is good but dark blue gives it a while to stay clean under fire on nursery floor. Oh my! Love this for sure thus I did procur! Love this rug! Arrived much faster than expected. The colors are rich. It's amazing for the prize. I'm very happy! Perfect rug and true colors. I ordered navy and it had the right amount of beige and red accent. Rug is beautiful and I get many compliments! Colors are close enough to the website to call it good. We have concrete floors, so we put a rug pad underneath, it is the perfect amount of cushion. Beautiful colors and easy to care for. "Hi, is it a loop style or high pile style carpet? I don't want my cat to pull loops..."
"Is this rug really thin? Want to put it in a high traffic area and don't want it to get curled up or moved around from walking." The pile height is approximately .5 of an inch. "Is the reddish color spots in it a red, or are they pinkish?" "Is there red in this rug or is more pinks and magentas?" It’s more pink/magenta. It’s a beautiful rug that I’m quite pleased with. "One description says a secondary color is red. Another description of rug, different size, says it's pink. Is it red or pink? Or both?" "Does this come in 12 feet length? " Unfortunately, we only currently carry this size option. "Are the accent colors more red or pink? Thank you! " There are shades of both colors. There also some shades of an orange red and shades of fuchsia.